YAY! 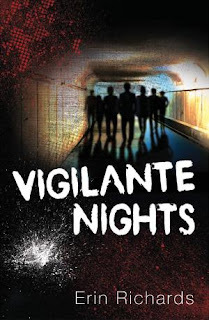 I just finished proofreading the galley of VIGILANTE NIGHTS! Therefore, I thought I'd share the stages a book goes through after acceptance by a publisher. In my case, my publisher is Merit Press, a division of F+W Media. At this point, all my edits are done, after going through two previous rounds of edits. First, a developmental edit, i.e. making changes to the story based on suggestions from my editor. I did those last November. My editor Jackie made some great suggestions, one of which returned an element to the story I had removed before I submitted it to her. Had she read my mind? I was super excited about that. I won't spill the beans, though. ;) After the book is released, I may blog about that issue. Anyway, I loved all of Jackie's insightful suggestions and happily made them! During my copy-edit period (on November 16), I received the preliminary cover from Jackie. I honestly didn't know what to expect. I had provided absolutely no feedback or suggestions for cover art like I had with my two romance novels. So I was a little nervous waiting for it. My fingers were practically shaking when I opened the email. I had no reason to be nervous. It was love at first sight. I love black and red. The paint brush font is so freaking cool along with the splatter of white paint. The silhouette of the "gang" is so mysterious and suspenseful. The cover is perfect. Merit Press then assigned a copy editor to VN to go over my developmental edits. In mid-December, I received the copy-edited manuscript back. Fortunately, Jackie had no issues with the changes I made during developmental edits. I had 10 days to go through the book again. During my copy edits I reviewed Merit's changes (and had the opportunity to raise any concerns, if any) and make any final changes I needed. These edits weren't bad (as my editor said, my MS was pretty clean to begin with). Even as clean as it was, there were still things I missed that the copyeditor picked up, like using "crude" when I meant to use "crud." Ugh. I know the difference. But when you go through your book a gazillion times, your eyes glaze over and you miss these things because your mind knows what it means even if your eyes aren't seeing it. Another dumb mistake: I used "white-beater" instead of "wife-beater" as in the T-shirt. Duh. Again, I know the difference, but my fingers on the keyboard didn't care and my eyes glazed right over it (in two places, no less). Those were the two dumbest errors I made. During copy-edit stage, I also drafted my book dedication and my acknowledgements. Then the manuscript was sent to the production department to lay out in galley form. The "galley" by definition is the final format of the book before it goes to "press," whether as a print book or eBook. In my case, VIGILANTE NIGHTS was laid out for hardcover print. I received the PDF galley format from my editor last Monday. Very exciting to see it laid out! My job was to proofread it. Merit Press would also proofread it. The next time I see VIGILANTE NIGHTS, it will be as an ARC (Advanced Review Copy or Advanced Reading Copy) in paperback format. ARCs are pre-published editions and are privately released by the publisher to reviewers, bookstores, magazines, and/or libraries. Also, during the time period stated above, I have been reaching out to published authors for potential cover quotes, and I had a book jacket photo taken. Finally, between all the VIGILANTE NIGHTS publication work I've been doing, I've been working on editing my next book before I submit it to my agent. Because of all this fun busy work, I'm a little behind, but hope to have the book polished to submit next month! There you have it! Every publisher is different in their processes, but all follow a similar path.